Learn about custom Reminder and Expiration email notifications that can be issued when a certificate issued in Policy Manager is nearing its expiration date or has expired. Log in to Policy Manager. Go to Configure > Certificates > User Certificate Renewal. The User Certificate Renewal Summary page is displayed, showing the configuration of the currently defined Reminder and Expiration certificate renewal email notifications. 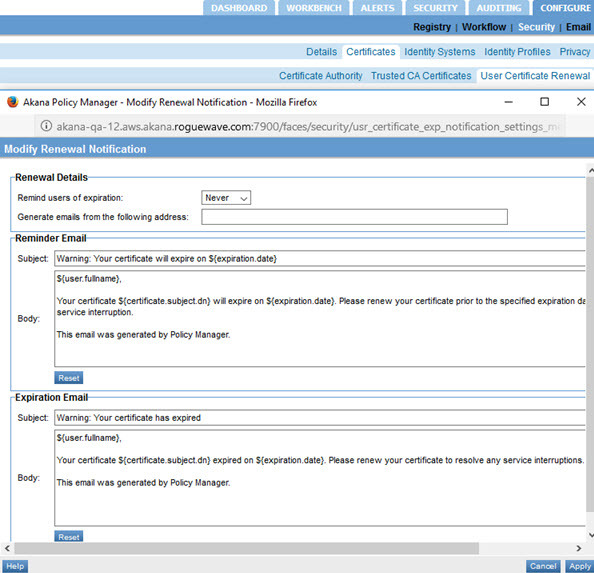 Update the Reminder Email and Expiration Email configuration for certificates issued in Policy Manager. Renewal details (reminder interval, From email), and email content are customizable. Substitutable variables representing certificate elements can be included in the email content based on your requirements. Go to Configure > Certificates > User Certificate Renewal. The User Certificate Renewal Summary page is displayed. Click Modify Renewal Notification. The Modify Renewal Notification page is displayed, as shown below, with the current renewal notification configuration. Once—Specify how many days prior to expiration, as shown below. Daily—Specify how many days prior to expiration the reminders start, as shown below. Weekly—Specify how many weeks prior to expiration the reminders start, as shown below. Generate email from the following address—Use this text field to directly enter the number of days prior to a certificates expiration that you would like an email sent. (Optional) Modify the Reminder Email. Subject—Enter a custom email subject line. Body—Enter the body of the email. Reset—Reset the email configuration back to the Policy Manager default email template. Optional) Modify the Expiration Email. Click Apply. Changes are saved and the User Certificate Renewal Summary page is displayed.